I had the huge pleasure today of presenting a community talk at the UK VMUG in the stellar location of the UK National Space Center in Leicester…there was an actual rocket! I’ve been super interested in the recent love fest of VMware and AWS. The titans of private and public clouds have entered into a marriage of stratospheric nerdy potential. 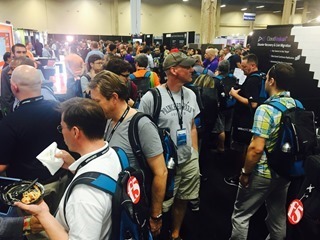 I recently attended AWS re:Invent with plenty of blogging! What interests me more than just running vSphere VMs on ESXi on Amazon hardware (which is a fancy colo if you ask me) is being able to take advantage of all the myrid AWS services from within those vSphere VMs. AWS has a vast array of service which can be consumed directly and can really help augment your tried and trusted vSphere VMs. I went through a short overview of the VMware Cloud on AWS service and delved more deeply into the key networking component which is the Elastic Network Interface. 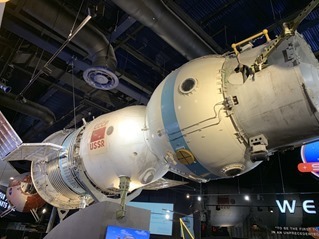 This is an AWS virtual Nic which connects the two clouds together. 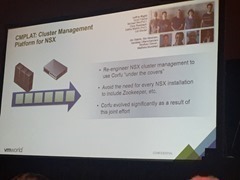 Then onto some real use cases like connecting vSphere VMs to storage with S3/EFS, connecting an app running on a vSphere VMs to a RDS database running in AWS. Then turning the connectivity around and using an AWS load-balancer to front a connection to a pool of vSphere web servers. I then spent some time going into the up and coming AWS-VMware options including RDS on vSphere which is running AWS RDS databases on vSphere in your datacenter. Then I also spoke about the very recently announced AWS Outposts which is AWSs surprising hybrid cloud announcement. Who would have thought but AWS hardware on-prem which has an option to run a vMware SDDC. There’s also CloudFoundation for EC2 which is using vSphere management and networking for EC2 instances wherever they may now be able to reside. Thanks for attending for the people who were there and if you weren’t able the be here today, hopefully the slides are useful. 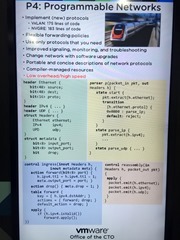 I particularly need to make special mention of the screen shots I borrowed from many other VMware and AWS presenters to make this presentation. I don’t actually have a VMware Cloud on AWS in my back pocket so needed to lean on the creation of others and curate their hard work for today’s presentation. See the slides for who helped. VMware and AWS have both made a significant investment in VMware Cloud on AWS. 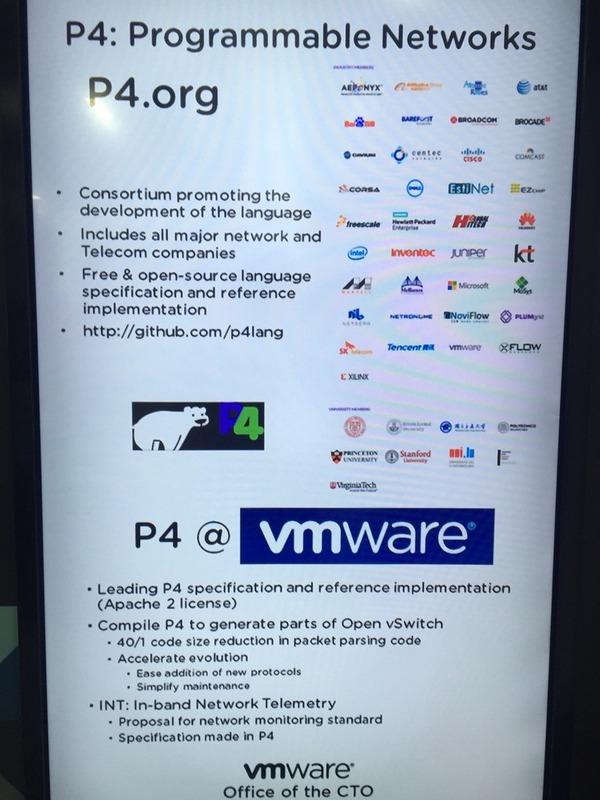 One of the interesting facets of this relationship is how the VMware and AWS communities are starting to cross over more than when VMware thought of AWS as just “a book seller”! 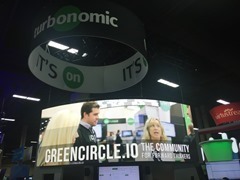 VMware has always had an extremely vibrant community. Some of it was timing, having a technology that became ubiquitous at the beginning of the rise of social media was a great combination. People across the globe and across IT disciplines could now communicate, share, geek out and become friends. AWS in a sense has not had this same kind of close community. There are many reasons, one being the AWS cloud was something new so it didn’t bring together older disciplines. Another is AWS is made up of a number of different communities which aren’t partitioned into the older network, compute and storage groupings but rather into higher order services like Machine Learning, Serverless and Big Data. 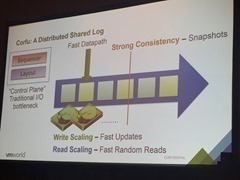 AWSs breadth of offerings is so much broader than VMware that it is a more spread out collection of different communities rather than a single large one. I’ve been happy to be part of come of the burgeoning VMware community at VMS events, we had a vExpert breakfast this morning. Many enterprises require replacing all vCenter certificates with Enterprise CA trusted certificates. vSphere 6.5 has made the certificate updating process so much easier than the complication of the vSphere 5.x days. Basic vCenter now has a single Machine SSL certificate as well as four Solution user certificates: machine (different from machine SSL), vpxd, vpxd-extension, vsphere-webclient. Although the Solution user certificates are only used for internal vCenter communication, many enterprise security standards require using enterprise CA issues certificates for everything. BTW, when you migrate from a Windows vCenter 5.5 to VCSA 6.5 using the excellent migration tool, only the Machine SSL certificate is taken across, the Solution user certificates remain self-signed and may need to be manually updated. Each Solution user certificate needs to have a unique name. You can use the VMware supplied vSphere Certificate Manager in the VCSA (sidebar, you should really be using the VCSA rather than Windows by now!) to generate the solutions user certificate. When you select Option 5 and then Option 1 to generate the certificate private keys and certificate signing requests to send off to your Enterprise CA, the tool has a particular format for the signing requests. I was happy to be asked to present at the National UK VMUG about Serverless. I had done the closing keynote last year so pretty relieved that I was at least invited back! The presentation was similar to the London VMUG presentation I had done in July although updated as the Serverless ecosystem is moving at breakneck speed. Changes of note since July are the addition of the new and momentum gathering OpenFaas framework, Azure Functions now available in the wild with Azure Stack, AWS adding more Lambda functionality particularly with its announcement that traffic shifting is coming soon for canary releases and blue/green routing. Iron.io bought by Oracle and VMware shutting down Photon Platform and shifting direction to Pivotal Container Service (PKS) and vSphere Integrated Containers (VIC). AWS Re:Invent is in less that 2 week’s time so I’m sure there will be plenty more to talk about! I went though some of the public cloud examples like Amazon Lambda, Azure Functions and Google Cloud Functions. There are also Kubernetes based options you can deploy yourself like Fission, Kubeless and Funktion as well as cross container platforms such as Apache OpenWhisk, IronFunctions and the new and exciting OpenFaaS. I spent time going through what events are, why they are so critical to understanding serverless and gave some examples. How much it costs was covered, the differences between PaaS and containers. Listed the benefits and currently many disadvantages as its very new. I also talked about how Ops is changing and doesn’t mean Ops goes away, just evolves. 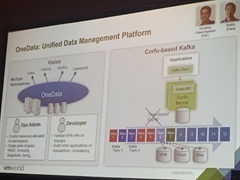 As it was a VMware user group I went through two connections to VMware, the kinds of things you could use serverless for to manage a VMware environment as well as the VMware cloud native story and using Pivotal Container Service the new Kubernetes based container runtime from VMware as your private serverless hosting platform. Functional billing was highlighted as probably the most important future benefit for serverless, being able to track the cost of every single function call you make which can very easily highlight the inefficiencies you have and the benefit of being now able to have business costings matching up to IT costings. 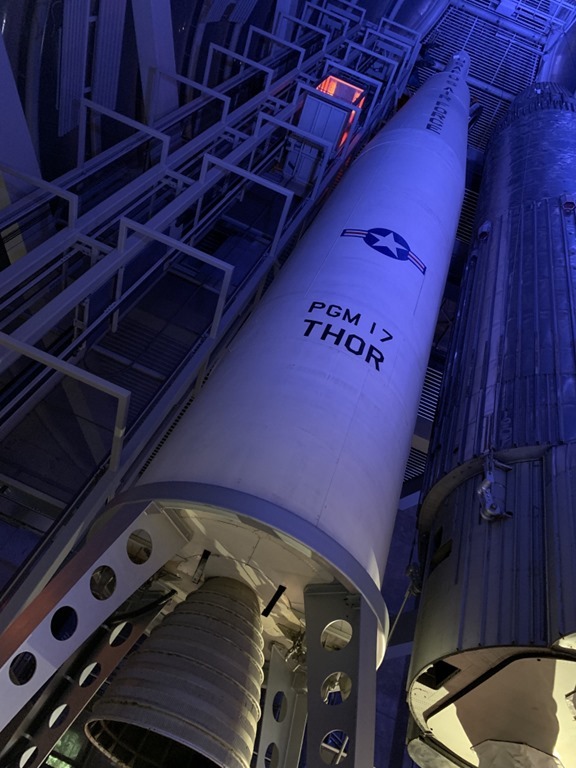 Looking into the future there’s lots that needs to evolve but perhaps this is the time to decide whether you skip PaaS and containers for some things that have event triggers and go straight to serverless? I was super happy to be able to present again at the London VMUG today on some tech that’s going to make a huge impact, Serverless. Yes, its a dumb name, as dumb as cloud but basically refers to Functions as a Service. I went through what it is, covering the important points of event driven user defined functions spun up and down on demand. There’s no infrastructure to manage from the point of the developer, the provider does all the provisioning and scaling. I went though some of the public cloud examples like Amazon Lambda, Azure Functions and Google Cloud Functions. There are also Kubernetes based options you can deploy yourself like Fission, Kubeless and Funktion as well as cross container platforms such as Apache OpenWhisk, IronFunctions and Funcatron. I spent time going through what events are, why they are so crticial to understanding serverless and gave some examples. How much it costs was covered, the differences between PaaS and containers. Listed the benefits and currently many disadvantages as its very new. I also talked about how Ops is changing and doesn’t mean Ops goes away, just evolves. 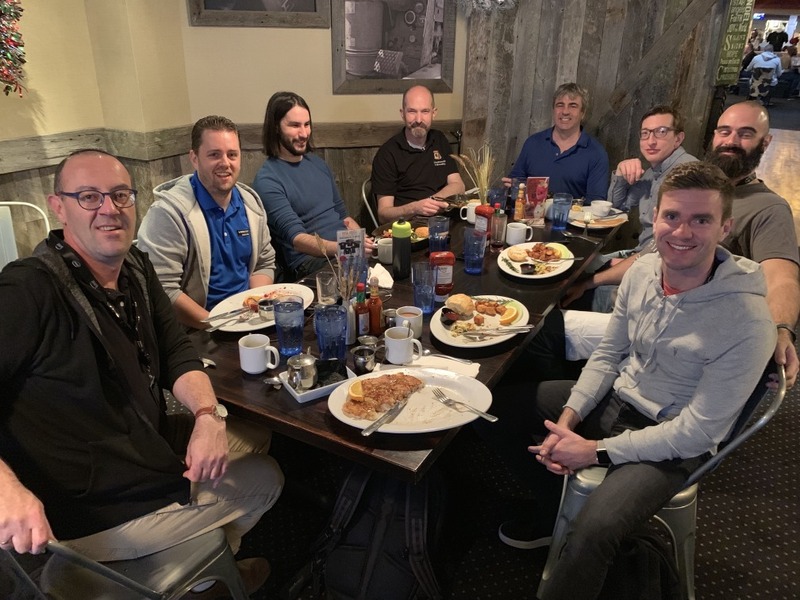 As it was a VMware user group I went through two connections to VMware, the kinds of things you could use serverless for to manage a VMware environment as well as the VMware cloud native story and using Photon Kubernetes as a Service as your private serverless hosting platform. 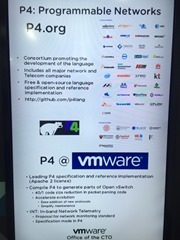 JeffConf is also very soon so mentioned the London conference. 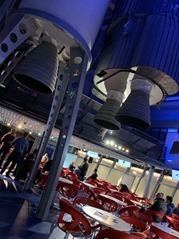 Thanks for having me London VMUG. I arrived at VMworld a little sceptical this year. So much is changing in IT, cloud and DevOps is actually delivering the promises of a better way to do things, I wasn’t sure VMware was up to the task of pivoting/extending beyond being the best VM hypervisor/management company around. I do see tons of things happening at VMware. Cloud native apps and container management are being worked on furiously as the immediate existential threat to the VM being the unit of IT consumption. Is this enough? Do we need to manage containers as VMs or should we be doing things differently? Squashing your existing applications into containers just as a packaging format and then having to back them up doesn’t really move the needle, you’re just moving the unit of consumption to a container yet with the same “restrictions” you had with your VMs. It was a real shame Docker wasn’t on stage and relegated to a small booth. Docker has developer mindshare and is dying to get into enterprises, surely VMware and Docker can work together, Microsoft doesn’t seem to have a problem with this. Although things are moving extremely quickly in IT nowadays, there is very much a long tail because if applications need to be rewritten to take advantage of this cloud native world, it’s not going to happen any time soon. Yet, because new applications can be written much more quickly and delivered to customers much more quickly, business have more more choice and agility when it comes to changing the software/services they use so that long tail may dwindle quicker than VMware would like. 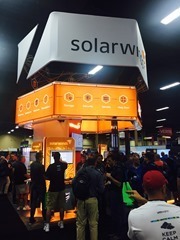 VMworld US 2016 Buzz: The Parties! 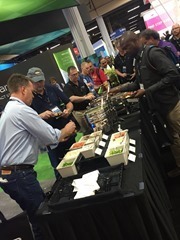 The VMworld parties are part of the experience, vendors & community get together to sell and socialise. Here are some of the parties I attended to get an idea of what’s happening out of the conference center. 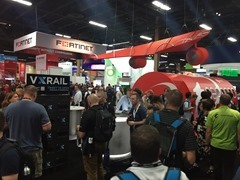 VMworld itself kicks off its sales side with the opening of the Solutions Exchange by a Welcome Reception, at first glance it looks like not much has changed with the move from San Francisco to Vegas with plenty of companies eager to tell you their stories. 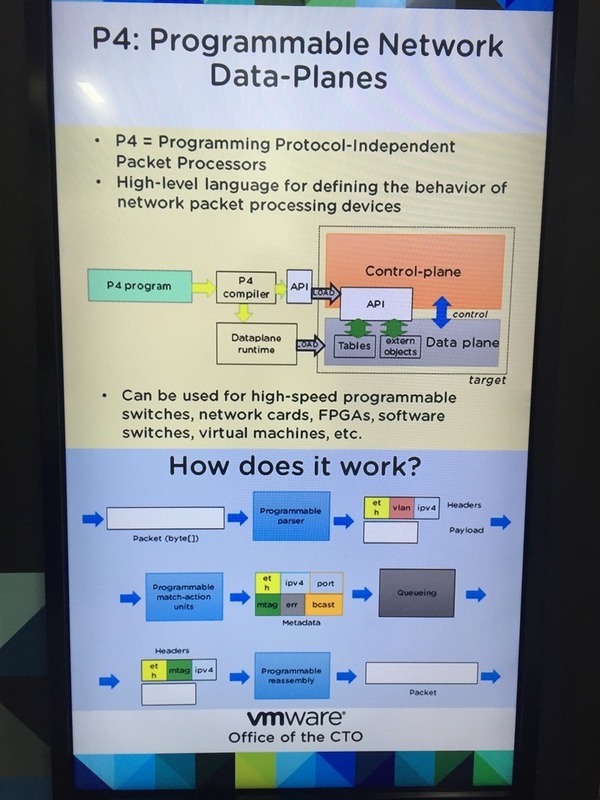 Mihau talked about P4 (Programming Protocol Independent Packet Processors). I had heard about P4 on the Packet Pushers Podcast (is that P3?). 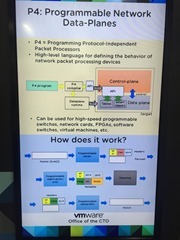 This is a programming language for programmable dataplanes so it allows you to reprogram the data plane which could be switches, FPGA’s, network cards, software switches, VMs etc. This allows you to build customisable protocols easily as new protocols normally take forever to get ratified. 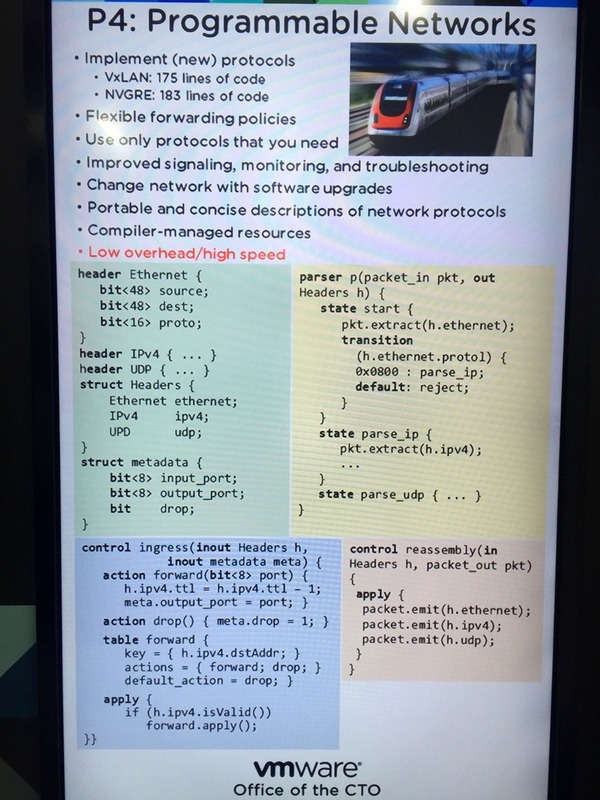 P4 looks great, you can reprogram switches on the fly to make it much more simple to run multiple kinds of networks or any kind of network extension rather than being hampered by current headers. 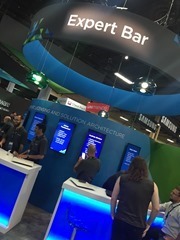 I made a point as I always do at VMworld to head to the VMware Office of the CTO booth to have a glimpse into the future. Michael Wei spoke about Corfu which is an open source distributed open scale platform. He went through how a typical application becomes distributed which leads to a whole bunch of tools to get this working. Corfu is meant to solve this by being a distributed shared log with strong consistency for massive scale. 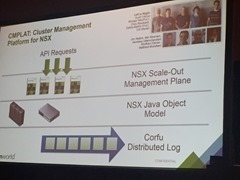 Corfu objects are in-memory, highly available data structures and are being baked initially into NSX to provide a much more scalable and flexible control plane. 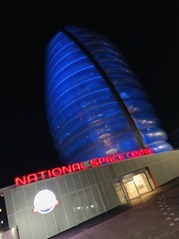 They are also researching new programming models to be able to take advantage of this. 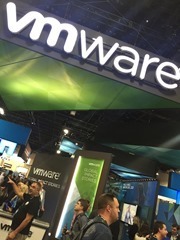 I made a point as I always do at VMworld to head to the VMware Office of the CTO booth to have a glimpse into the future. I spoke to Aditi Ghag. This is all about building a congestion aware, fine-grained, distributed network load balancer. This means as soon as the packet enters the network at the vSwitch or physical network switch when using SDN you can decide on which path it takes rather than having the network load balancing have to consult a central service. I haven’t found an associated research paper, if there is one out on the internets somewhere, let me know and I’ll link to it.